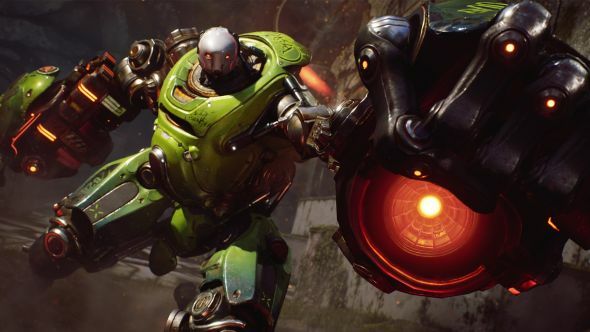 Free-to-play third-person MOBA Paragon continues to deliver a new hero every three weeks, and melee brawler Crunch is the latest addition to the roster. He goes live on Tuesday, November 15. Find some more people to punch – in different contexts, with different weapons, sure – in the best multiplayer games on PC. Re-Crunch – Re-Crunch repeats the last ability used, opening up more possible combos. It also has two passive components. First, landing basic attacks shaves time off your cooldowns. Second, every third ability used is empowered. Forward Crunch – Launches Crunch forward, stopping on the first enemy hero hit, dealing damage. When empowered, Forward Crunch pushes enemies the full distance of the charge. Crunch is a melee-only hero who belongs to the “fighter” class and the fury/order affinities. Paragon is free-to-play, so if you like what you see, you can download and play it now. All heroes in Paragon are also free, so you can start punching your opponents as Crunch on Tuesday.